Due to my botched hair job in June 2016 (YES 2016 and I’m still repairing my strands!). I've been avoiding anything that omits heat in fear of further damage to my hair. It's been a long healing process and I've spent a small fortune on treatments and products. BUT my hair is finally 'almost' back to its original state and can take a little heat. I'm excited to experiment with hair products (other than repair haircare) and stylers.. The Polished Perfection Mini Straightening Brush by Amika is great for travel, on-the-go styling and touch-ups. The straightener and hairbrush in-one device smooths your hair, leaving it shiny and frizz-free. This mini heated styler is meant for touch-ups, not all-over styling. I have very fine, short hair, so it does meet my styling needs. If you have a long mane, this styler is not for you - you'd be hours tryna tame your strands. Amika's mini thermal straightening brush has a consistent temperature of 410° (210°). That's hot! I've read that 365° is optimal for safe styling. My go-to hair straightener, the T3 SinglePass Compact Iron, also has a set temperature of 410° and I don’t find it damages my hair - I usually pass the iron once quickly by sections and I only straighten my hair twice a week. I’m sure lingering and continuously passing the iron along your hair would cause damage at a high temperature of 410°. Be careful! The design is great. The brush is small - only 7 inches in length and has an easy-grip handle. 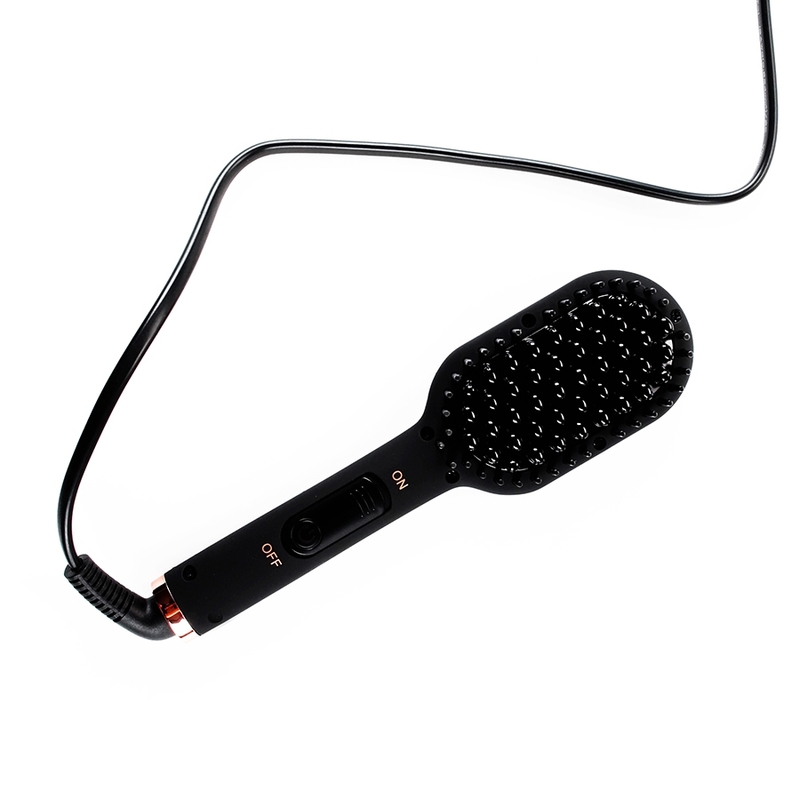 The 360° swivel cord is heat proof and allows you to style with ease. 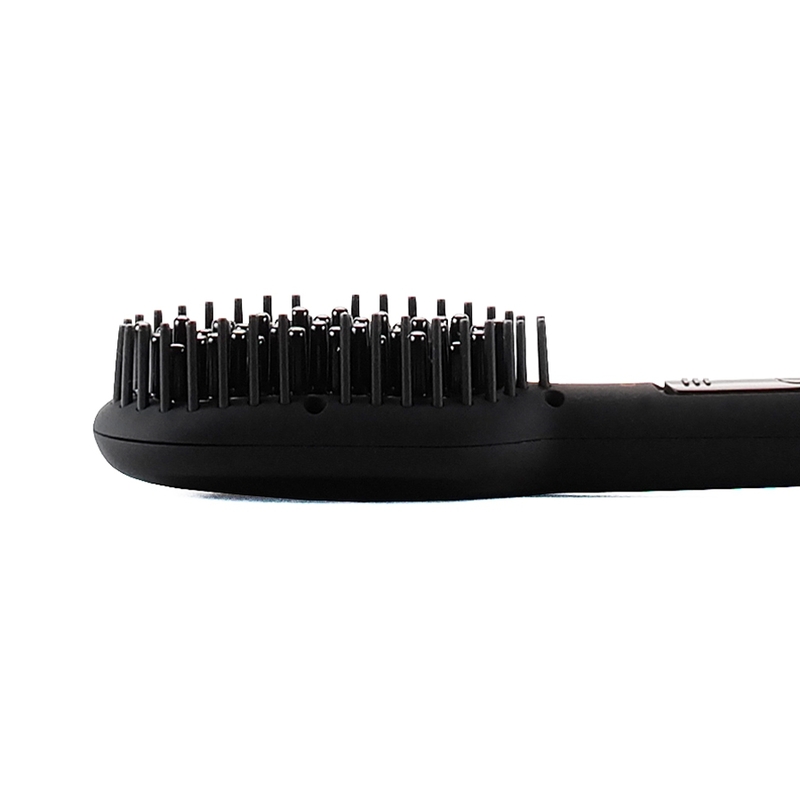 The ceramic bristles with Nylon Cool-tips glide through your hair easily, straightening from all-around. It does take a little practice to master this styler. The original Polished Perfection Straightening Brush is full-sized. The design is the same, but is quit a bit larger. You can adjust the temperature on the original, but the voltage is only 120V. The mini version has universal voltage - 110 to 240V, is small enough to throw in your tote and travel friendly. The Polished Perfection Mini Straightening Brush comes with a rose-gold toned travel pouch. You could fit two mini brushes in the pouch - I'd prefer it was more fitted to the device. I suggest throwing your hair accessories in there too.